Mouse traps not working? Mice seem to be too smart for conventional traps in some circumstances – it seems like they’re spreading the word about the traps. And if you’re using a mouse deterrent, you’ll often find that they’re a hit or miss; sometimes deterrents work, and sometimes they don’t. An electronic mouse repellent may be the key to your problem. What Are Electronic Mouse Repellents? How Does Electric Mouse Repellent Work? Do Ultrasonic Mouse Repeller Work? The EHouse Ultrasonic Repeller drives away various bugs and pests, including rats, rodents and flies among other insects. Being non-toxic and odorless, it is safe for the environment and other animals in your home. Covering over 1600 square feet at a voltage of 100-240V, it’s effective in many areas. The dual effect ultrasonic repeller and night light are also quite efficient, making it ideal in all areas like houses, offices and gardens. Effective to use both indoors and outdoors, the Triple Action Rodent Repellent works on mice and rats. Other animals it repels include cockroaches, spiders, mosquitoes and moths. Covering up to 1100 square feet, the repellent emits 3 different ultrasonic wave frequencies and signals. The signals penetrate into the walls through the wiring system, irritating pests as a result. The frequencies alternate at a constant rate for fast action. As a result of this, the pests cannot easily adapt or grow resistance. Although this feature is effective for mice and pests, some people found the sound to be audible and irritating. However, its low power consumption rate of < 15W is a boost if you want to spend less on electricity bills. Insects, rodents and pests all flee from the ultrasonic sound of the TangN pest repellent. Through the stimulation of their nervous and auditory systems, bats, fleas, wasps and rodents will all run out of their hiding areas. Using a control chip that determines the range of the ultrasonic frequency for pest repelling, this unit is safe to use in the home. All you need to do is insert the socket, press and hold the repellents’ power button for around 3 seconds and the ultrasonic frequencies are emitted. The unit covers 1200 square feet. With a 360̊ coverage, an ABS flame retardant material and low power consumption, you can safely relax and let the repellent do its job. The Victor Heavy-Duty Sonic Pestchaser gets rid of all the mice and rats as well as other rodents from your home. It releases high-frequency sound waves that vary in intensity, preventing the rodents from becoming immune to these sound waves. It is perfect to use in large rooms by placing the 6-foot cord into a wall outlet in an ideal place. However, the ultrasonic frequencies released cannot penetrate through furniture. Because of that fact, each room should have its own unit. 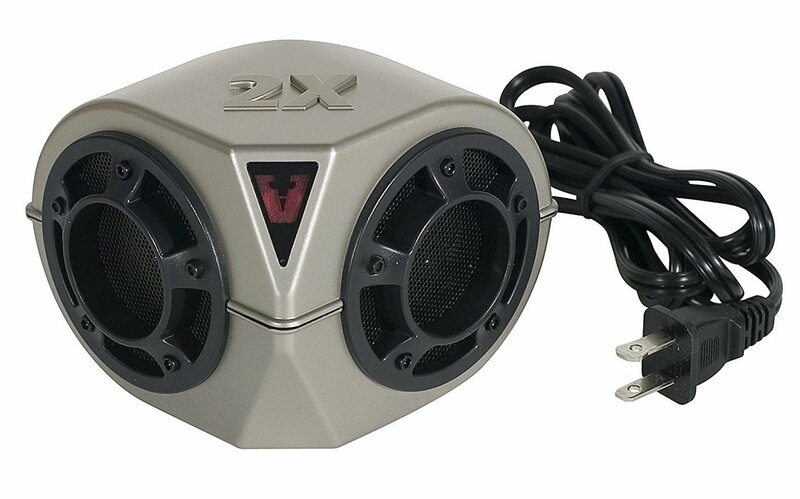 It doesn’t produce any sound, making it safe for both pets and your entire family. Also, the red LED light enables you to track how it works. The YIVEN pest repellent is a great repellent for areas infested with pests and insects, which include rats, mice, ants, mosquitoes and roaches. The unit does not kill the pests, but through the ultrasonic frequencies it releases, the pests are forced out of the places where they live or hide and out of your home. Covering 800 to 1200 square feet, it is ideal to use in any place infested with pests and insects. It’s very simple to use: all you need to do is plug the repeller into any socket in your home and switch it on. This ultrasonic pest repeller by Repel It! is effective for the control of mice, rats, cockroaches and other insects and rodents. The dual technology system in the unit gets rid of any pests that might be hiding in cracks within your home. Through the combination of ultrasonic and electromagnetic waves, it can penetrate into the cracks and get rid of the pests. All you have to do is simply plug it in and switch it on. Covering 5000 square feet, this repeller comes in a 4-pack, making it suitable and ideal for various rooms in your home. With each unit covering 1250 square feet, you can rest assured that it will work perfectly and save you the extra cost of buying several units separately. The EverPest Ultrasonic Repellent is very powerful and effective in eliminating mosquitoes and other pests such as ticks, mice, moths, spiders, bed bugs and cockroaches. By plugging it in and switching the power on, this organic unit emits ultrasonic waves that disrupt the normal activities of crawling pests and insects. This forces them out of your home, leaving it peaceful without the sound of mice running and making noise all over the place. Covering up to 2200 square feet, you do not require any chemicals, traps, or poison to get rid of mice, rats, or pests. The Cordking Ultrasonic Pest Repeller forces out roaches, ants, rats, mice and even bugs hiding in crevices within your home’s walls. This environmentally-friendly unit is safe for both humans and any pets that you might have in your home. It has a standard wall plug-in feature that allows you to plug it into a socket in any suitable location in your home. Covering 100-150 square meters, it is effective for small spaces, making it an unsuitable option for larger areas. Another limiting factor is the fact that it only functions for indoor use, unlike others that function both indoors and outdoors. If you do choose to use an electric repellent, make sure that other methods are used alongside these devices to finally put an end to your infestation problem. Otherwise, proceed with caution, as repellents can only do so much to help a home overrun with pests. Over the course of history, man has dealt with mice and other rodent problems with different types of repellents. Most of these traditional repellents used chemical or sensory signals to ward off these pests. Natural products such as chili and mint were traditionally placed along areas where these unwanted animals would typically frequent. The ancient Chinese people even used repellents that made use of sound waves to deter rodents. Scholars noted the use of mechanical devices that had to be manually operated to create sounds. These sounds were said to be a deterrent to mice and rats. As technology progressed over time, a new type of repellent was available to the public: electronic repellents. Simply put, electronic mouse repellents are electronic devices that are typically plugged directly into power outlets. These devices produce high-frequency waves that, while inaudible to the human ear, cause an irritating sensation to the more sensitive rodents. These electronic mouse repellents make use of the natural physiology of rodents, wherein they typically communicate in a higher frequency than us humans. Therefore, their ears are able to pick up frequencies that are much higher than the highest threshold a human can hear. The irritating sensation will cause mice and rats, the target organisms, to seek out environments that are more conducive to them – preferably far away from where you plugged your electronic mouse repellent. There are different ways to control rodent pests. Some prefer outright killing them, while others prefer trapping them and letting them go far away from their homes. For those in search of a more humane method of pest control while avoiding the extra effort of dealing with trapped mice, repellents are an excellent choice. While there are different types of pest control methods, there are also different types of repellents with their own set of advantages and disadvantages. Here are but a few advantages that electronic mouse repellents have in general. Possibly one of the better advantages electronic mouse repellents have would be their overall safety. A common method of mice control is through the use of poison. While the use of common rat poison remains one of the more prevalent methods to control these pests, this method does come with a price: risk. In order to attract mice, these poisonous baits often come in bright and attractive colors to lure rodents to feed on them. Unfortunately, due to these visual characteristics, these poisonous pellets can possibly be attractive to non-target organisms that reside in your home. For example, your pets or even worse, children. Especially when these toxic baits are just lying on the floor, they present a risk to other organisms that may come in contact with them. Even in the realm of repellents, there are some that can pose possible health risks to the people and pets inside your home. For instance, chemical repellents can give off toxic substances that would linger in the air inside your house. These would eventually find their way into the residents of the house, causing health problems such as skin and respiratory irritations. Fortunately, electronic mouse repellents would be on the opposite side of the spectrum when it comes to general safety. These repellent devices are designed and equipped to be effective only to mice and rats. This means that dogs, cats and humans won’t have any problems dealing with this. Unless they see the device or know about its presence, they probably won’t notice it at all. It’s important to know that a repellent does not kill mice. Yes, there are electric traps that will zap a mouse to death in five seconds on average, but when a mouse dies in the process, this is not considered a repellent. A repellent is something that keeps mice away because they dislike it. When using an electronic repellent, you’ll be using ultrasonic waves to make sure that rodents do not take up residence in your home. But don’t worry, you won’t hear the mouse repellent sound – and the waves won’t hurt. You’ll purchase one of these devices, often called an “ultrasonic mouse repeller,” and follow the instructions on the back of the box. These repellents are very easy to use. 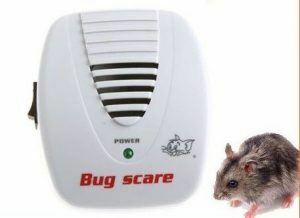 Buy the electronic rodent repellent. Plug the repellent into the electrical outlet. That’s it. In just two steps, you’ll have the repellent emitting ultrasonic waves that will wash over any mice that come in contact with it. From personal experience, you’ll never feel the wave when standing in front of the device, and pets don’t seem to be bothered by the waves either. Electronically created, these waves are beamed out into the area and will come in contact with mice. If the mice makes contact with the waves, they’ll feel the waves wash over their body and turn the other way. This is a feeling that the mice don’t like, and won’t recognize either. These devices will create a force field of sorts that will repel the mice and keep them at bay. An issue with this is that the waves are only so long, and they’ll often follow a small path. For example, if you placed a device in your living room on the back wall, the beam may only reach half the length of the room. If the mice as not in the beam’s path, they’ll ignore the ultrasonic waves, and keep walking by. It really depends. These devices are limited by range, so in some cases they work, and in others, they fail miserably. There is also the case for different devices working better than others, so you really need to do your due diligence to find a repellent that is worth the money. The evidence is anecdotal at best. But if you do want to boost the chances of this method working, there is a lot that you can do to propel your results further. Place Devices Everywhere: We know that these waves need to reach the mice, so you must have all of your home’s interior covered in terms of ultrasonic waves. If there is a power outlet, try to plug a device in it so that the waves can reach any potential mice that call your home their own. Waves Won’t Go Through Objects: You’ve placed repellents all over your home, even behind your furniture and couch. But the problem is that the beams can be obstructed. A couch or a piece of furniture will stop an ultrasonic beam in its tracks, causing the beam to never reach its target. Place Devices Strategically: If you can’t afford to fill every corner of your home with a mouse repellent, you need to start planning your strategy in an effective manner. Where are the mice seen most often? Where are mice entering the home? These are places you’ll want the ultrasonic waves to reach to repel mice. And remember that a repellent is just a repellent – it won’t kill the mice or seal entryways into the home. If you want to kill mice or stop them from ever entering the home, it’s important that you employ other methods to solve the problem. Finding and Sealing Holes: The truth of the matter is that mice are getting into your home somehow. And this means that they can keep coming through this same hole year after year until its fixed. Find the entryways and seal them off if you want a foolproof method to keep mice away. Lay Traps: Mice can be cute, but they also carry disease and bacteria, which is not good for a home. Laying traps is the only way to really remedy the problem. You need to lay traps in areas where the mice are frequenting. I won’t go into detail about humane and inhumane trap options, but know that both do exist. Clean Up: There are times – no matter how much we hate to admit it – that we’re the main cause for mice. A home that is dirty and filled with food that is rotting is the perfect place for mice to thrive. Clean up your home, and cut off the food supply of the mice for best results. An issue with other repellents is that they often have to be strategically placed in order to be effective. During the olden days, a popular repellent to use against rodents in large warehouses would be powdered sulfur. In order for it to be effective, the sulfur had to be sprinkled everywhere on the floor – most especially around the wares containing food. This method proved to be effective, but with the disadvantage of having to make sure enough powdered sulfur would surround the perimeter of the edible goods. Not only was this pest control method time consuming, it also demanded a significant amount of resources. This is where the electronic mouse repellent can shine. While it is much more recommended to have the device near areas where you specifically do not want pests such as the kitchen or the bedroom, these devices can be placed absolutely anywhere as long as it can be plugged in. Furthermore, its effect is not restricted to the room where it is plugged in. As long as the device is plugged in, it would emit its high-frequency waves in all directions, making an invisible shield that would span a wide area. To further maximize its effectiveness, it should be noted that each home is not restricted to having only one electronic mouse repellent. The more devices emitting these irritating sound waves, the more likely rodent pests would scurry away in search of a more comfortable environment. Pest control methods often require a significant amount of effort to perform. Even the most popular control method, the use of poison, still needs some work. While it is true that sprinkling the poison in areas of high rodent traffic can be quite easy, the hard part comes when it is time to find the dead mice and remove them before they stink up the place. Mechanical traps would need to be set, propped with bait. If you happen to catch a mouse, then you would need to get rid of it and repeat the entire process again. Comparatively, electronic mouse repellents are extremely easy to use. After all, the steps necessary to make them work simply include taking them out of their packaging and plugging them in. Those are all the steps you would ever need to take to make electronic mouse repellents effective. The pests would leave the premises on their own and there is nothing you would have to change, reset, or deal with – as long as the electronic mouse repellent is plugged in.